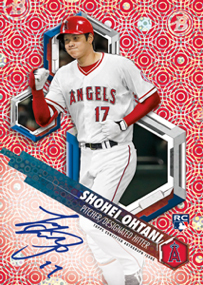 2018 Bowman High Tek Baseball marks the second time the acetate line has been given the rookie and prospect treatment. Like all Tek sets, plastic acetate cards are a cornerstone along with a large number of patterns. Autographs are also plentiful with four coming in every ten-card box. 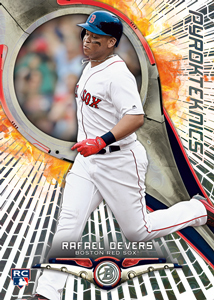 It’s all up-and-coming prospects and rookies when it comes to the main 2018 Bowman High Tek Baseball set. Cards are done on acetate, which not only makes them strong, but see through as well. Foil backgrounds add a modern flair. They also offer a deep chase elements, particularly for player collectors. Every base card has ten different background variations. The first pattern is the most common in each box and is considered to be the base. Ensuing pattern numbers are increasingly difficult to pull until you get to Patterns 9 and 10, which are both one-of-ones. Pattern 9 cards are called SpecTEKular Diffractors while Pattern 10 are Black Galactic Diffractors. On top of the pattern variations, Pattern 1 base cards have additional parallels that mix in color and additional layers of patterns in the card stock. These include: Purple Rainbow (/150), Green Rainbow (/99), Ocean Blue Tidal (/75), Gold Rainbow (/50), Orange Magma Diffractor (/25), Red Orbit Diffractor (/10), Printing Proofs (1/1) and Black Orbit Diffractors (1/1). Parallels combine to land one per box. High Tek Autographs are the key signature component in the product. These are on-card autographs with a design that’s virtually identical to the base set. Parallels include numbered Purple Diffractors, Green Rainbow (/99), Ocean Blue Tidal (/75), Gold Rainbow (/50), Orange Magma Diffractors (/25), Red Orbit Diffractors (/10), Printing Proofs (1/1) and Black Galactic Diffractors (1/1). 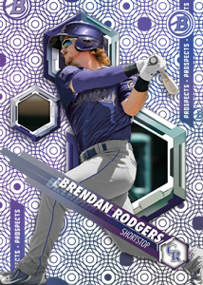 2018 Bowman High Tek Baseball has three regular insert sets. All come numbered to 99 for the base versions and have Ocean Blue (/25) and Black Galactic Diffractor (1/1) parallels. 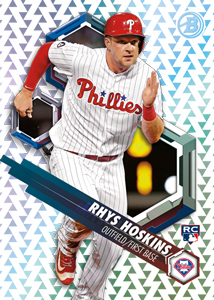 1st Bowman Tek takes prospects who had their first MLB cards in 2018 Bowman Baseball. These give those cards an acetate makeover. PyroTEKnics feature young players with a fireworks design. Finally, there’s Tides of Youth, which takes the phrase literally by casting players on cards with water-themed designs. 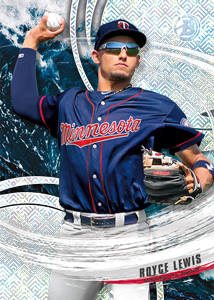 Think of it as an updated version of the Wave of the Future inserts from the 1990s. Select players in each of these inserts are also on autograph versions. Like High Tek Autographs, these are all on-card.